Kybella is the first and only FDA approved non-surgical treatment for reduction of stubborn fat under the chin area. It is indicated for people suffering from moderate to severe neck fullness or double chin appearance who do not wish to undergo invasive surgery like liposuction, but wish to still achieve better chin profile. Kybella is made from Deoxycholic acid, which is a naturally occurring substance in our bodies and it is responsible for breakdown of fat cells (lipids). It is a cytolytic drug which disrupts fat cell membranes by a mechanism called lysis, aka cell burst. Who can get Kybella® Treatment? According to 2015 survey completed by the American Society for Dermatologic Surgery , nearly 67% of adult consumers said they were bothered by submental fullness. In general, adults over the age of 18 who are bothered by their neck profile and feel like they have excess under chin fat are eligible. To determine if you are a candidate, a detailed physical examination must first be performed by Dr. Avaliani during your consultation visit. Is Kybella® a single treatment or multiple? Kybella is usually performed as a series of treatments, usually between 2-4 but up to 6, which are scheduled at least 4 weeks in between. One must understand that each individual varies in anatomy and the amount of submental fat, therefore, the treatment plan varies from person to person. Some people can achieve desired result after just one treatment, while for some it will generally take anywhere between 2-4 treatments. Kybella works by causing disruption of vital cell membranes resulting in cell lysis aka cell death. Once the cell is destroyed it cannot store or accumulate fat again. * Further treatments usually not be necessary once the desired outcome or profile has been achieved. Will I have loose skin after Kybella® Treatment? Younger patient usually do not have any residual skin laxity since their skin already has good tone. For Older patient whose skin is a little loose , after Kybella treatment, their skin usually gets tighter, but in case there will be small residual area of loose skin under chin, Dr. Avaliani can offer a treatment combination with Ultherapy, the one and only non invasive FDA approved skin tightening device. How do I prepare before my treatment? One should not consume any alcoholic beverages at least 48 hours before the treatment. If you are taking Aspirin for medical concerns, please consult with your medical provider first, if it would be okay to stop it one week before your treatment. Dr. Avaliani will mark the treatment area first, she will then apply topical numbing cream to decrease any discomfort during the injection procedure. If desired, oral or injection pain medications are also provided. She will then thoroughly clean and disinfect the skin and apply a stencil treatment guide to the area to be injected. The amount of injection sites will depend largely on individual’s anatomy and the size of the area to be treated. It usually takes 15-20 min. The procedure is performed under sterile conditions and Dr. Avaliani is one of very few physicians in New York to offer direct vessel visualization using a special light (AccuVein) to help avoid injecting into a small vessel or a vein, therefore virtually eliminating any chance of potential bleeding or bruising. The cost of the procedure will be determined at the time of your evaluation. Dr. Avaliani will apply a treatment grid and explain to you the amount of product that will need to be used in the treatment area. The cost of the treatment directly correlates with the amount of product to be used. 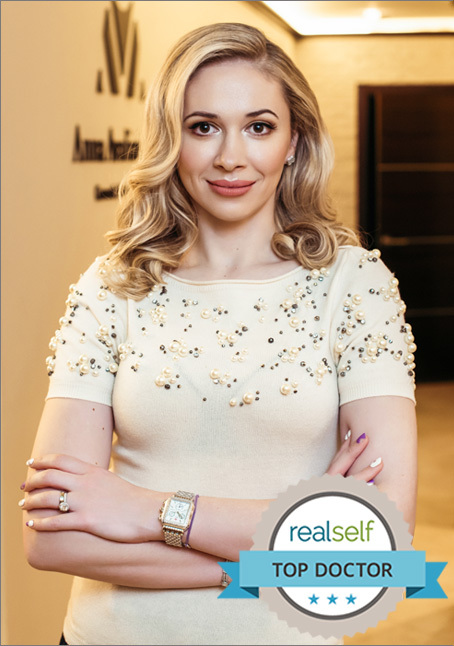 Dr. Avaliani completely understands that this treatment is highly desirable amongst many young professionals who might not be able to afford it and she gladly offers CareCredit option to who who qualify for this non invasive and life changing treatment. How long is the downtime after the treatment? There is virtually no downtime after this procedure and clients may return right back to their regular duties. Most often, clients choose to have this procedure performed at the end of the workday or before the weekend and Dr. Avaliani has office hours to accommodate those time slots. What are contraindications to Kybella® treatment? Presence of an active skin infection at the site of potential injection site is an absolute contraindication to receiving your treatment. What are the most common adverse effects after the treatment with Kybella? The most common side effects reported were swelling, pain, bruising, bleeding, numbness, redness and tenderness to touch. The most significant and discomforting side effect was swelling , which can become significant, but the swelling is a sign of the product working and actively destroying those fat cells. There is no reliable way to predict the individual change of developing swelling, but generally younger individuals with firmer skin tone develop less swelling compared to older individuals, who have less skin elasticity and can afford to accommodate more swelling. The amount of swelling is usually the greatest after your first treatment, and usually minimal to none occurs at the second or even third treatment visit. What is Kybella satisfaction rate? An outstanding 79% of patients treated with Kybella reported satisfaction with their appearance in face and neck contour and also reported looking younger.